At the top left hand side of the picture you are seeing the bottom portion of Market Street. 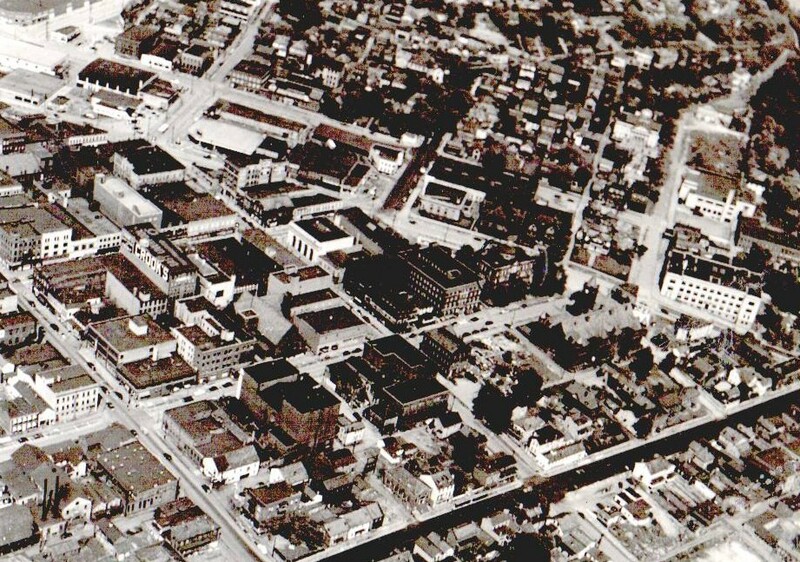 At the bottom left hand side of the picture you see a very small section of W. 6th St. beginning at the corner of Jefferson St. and West sixth Street. At the top of the picture from center to right, is the Ohio River. At the far right of the picture you have Monroe Street, starting with the corner of West Fifth St. and Monroe Street. Monroe comes into the picture near the far right bottom of the picture and Mornroe, mostly the East side of it runs towards the top of the picture in the direction of the river. The street in the center of the picture running vertically through the picture is Jefferson Street. The three main cross streets visible in the picture are top to bottom, West Third St., West Fourth Street, West Fifth Street. Clearly visible is the Catholic Church, corner of Fifth and Jefferson, and the Catholic school near the alley between Jefferson and Monroe on West fifth. Framed by Market Street at the bottom, Walnut Street is to the left as you look towards the top and left of the picture. Looking to the left towards the river you can see the River Road and the Hill Road both disappearing off the picture as they aim towards East End. The bus station with buses is visible in the picture along with the Mermorial Auditorium, the High School, Central Building and more towards the business district is the Little Building in the "Diamond". Close-up of part of the business district. 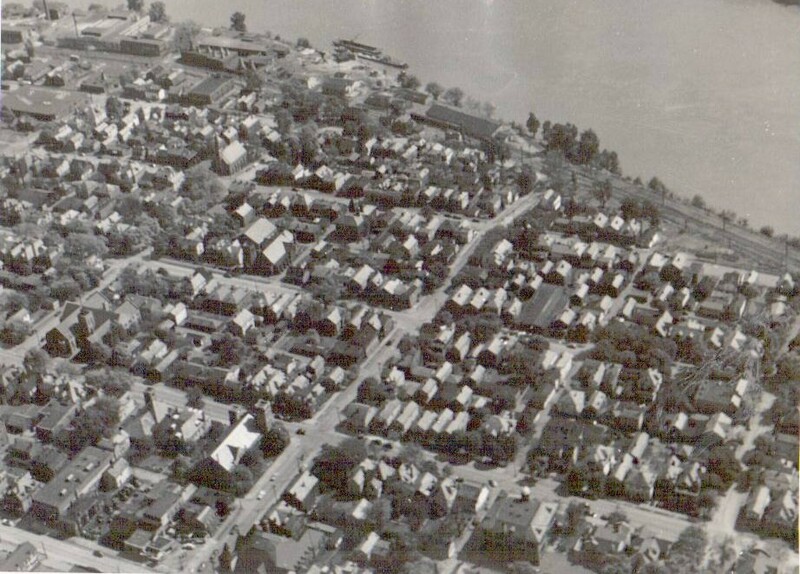 The bottom street is East Third St.. Broadway is in the center, Market is to the left, Walnut is in the upper right. East Third, East Fourth, East Fifth Streets and a portion of East Sixth Street are visible. The above picture comes from the article The Adamant Porcelain Murders written by Timothy R Brooks in 1984 Pottery Festival Souvenir Program. 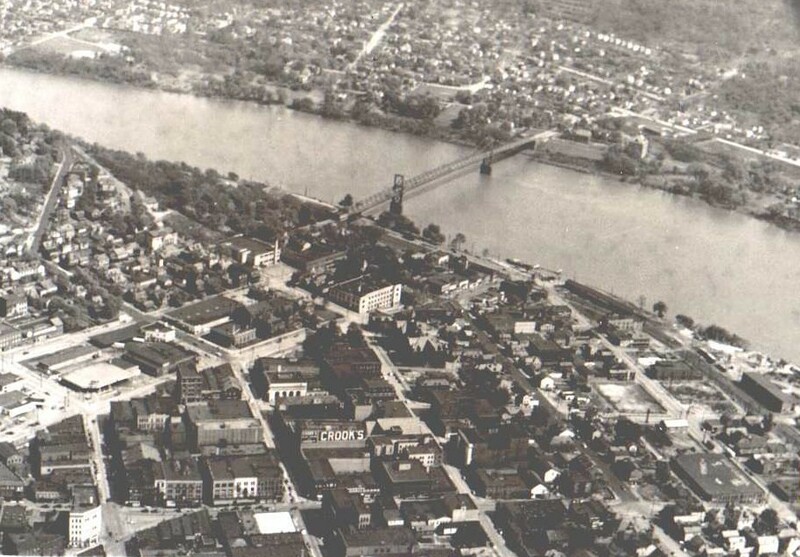 The picture shows the west end of East Liverpool. The date of the picture is late 1930s or early to mid 1940s. 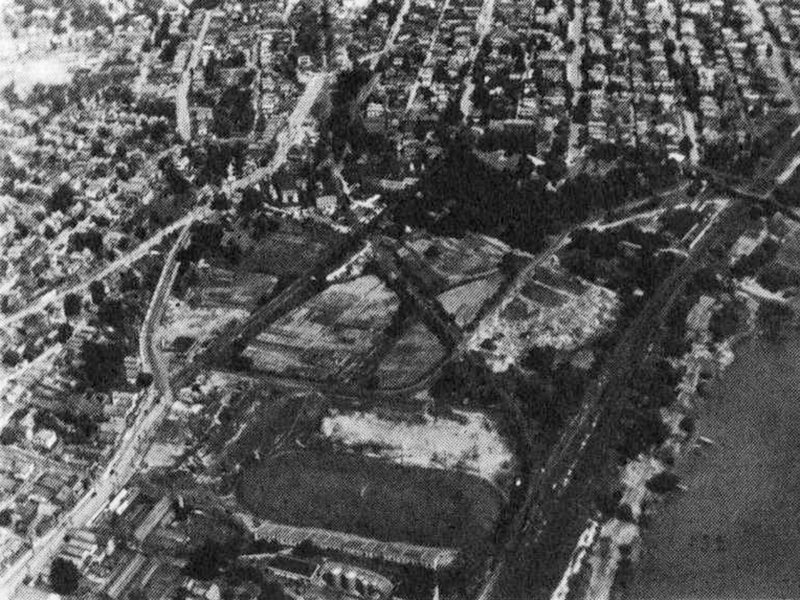 At the bottom center is Patteron Field, the High School Football Field. The open space in the center shows the Horn Switch Railroad tracks that led into the downtown area. The trolley tracks trestle from West 6th Street to the 8th Street area is visible. Notice that 8th Street at that time didn't run in the exact same way as it does now. This area would in time become where Westgate would be built. The Adamant Porcelain Pottery can be seen slightly to the right of the area where Westgate would eventually be built.